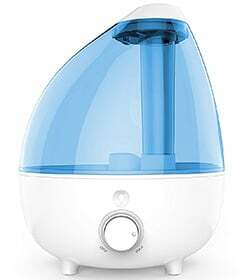 I first came across humidifiers a few years back after suffering from repeated eye infections caused by dry eyes that would just not go away. I had tried everything recomhe number of positive features it has! Because it’s small, it would make a great portamended by doctors but the infections kept returning and it would get to the point that in order to be able to open my eyes in the morning, I was running to the bathroom to stick my head under the faucet! My problem was only resolved after a colleague recommended me having a humidifier in my bedroom overnight to prevent my eyes becoming too dry. I was skeptical I must admit, but I bought a humidifier and tried it out overnight for the first time. To my surprise, I could open my eyes when I woke up! They weren’t dry and irritated and I didn’t feel the need to rinse them. I was sold! Because my eyes remained moist overnight, I was also able to fight off the recurring eye infections and I’ve never had one since. So, for whatever reason you’re looking into getting an ultrasonic humidifier, this ultrasonic cool mist humidifier review will help you. Why Is Humidity Important for a Healthy Life? Why Is an Ultrasonic Humidifier Better? Trust is an important issue when researching products to buy online. After all, anyone can write a review and post it to the web! Here at The Soothing Air, we pride ourselves on being a website you can trust and here’s why. We have been doing this job for over five years, so we have tons of experience in the field of methodical product research and reviews. We don’t have any other purpose other than providing our readers with the most accurate and up-to-date information about the products available and the quality of them. We don’t work alone – we have several people involved in the process, including many volunteers from a diverse group. We make sure we vet their reviews and comments so that nothing we publish is subjective or biased. Secondly, we make sure that we always look at different manufacturers and brands. This shows you that we are not biased towards a specific manufacturer, nor are we trying to promote any specific brand. Finally, we make sure our reviews are for everyone. We have selected picks for all kinds of users, ranging from home users to professionals. So, whoever you might be, this ultrasonic cool mist humidifier review will help you make your all-important decision. Humidity plays an important role in maintaining a healthy lifestyle. Its importance is often overlooked, or not known about in great detail. However, as your comfort depends on whether you feel too hot or too cold, it is really important to understand how humidity, as well as ambient temperature, affects your body. If the humidity is too high, your body loses its ability to cool down through the production and evaporation of sweat. This can be pretty dangerous if prolonged for a long period of time as it can cause overheating. If overheating occurs, the body can suffer from heat stress or other problems with breathing or problems with the heart. The answer, of course, isn’t to have low humidity either as this can cause its own problems. If there is not enough moisture in the air, your chance of catching a virus is increased. Firstly, this is because viruses survive longer in areas of low humidity. Secondly, when people with a virus sneeze in low humidity, the water droplets and nasal secretions they expel stay in the air for longer and are finer, which means that others can catch the virus more easily. Low humidity also affects the body physically. For example, if the humidity is too low you can suffer from dry eyes because your tears will evaporate too quickly. The same goes for the skin. If moisture evaporates too quickly from your skin, it can make you itchy or you can have dry and scaly skin. This is often a problem during the winter months. In terms of breathing and airways, low humidity can be an irritant. If the airways are irritated, they are more susceptible to catching an infection. Before we begin to look at the best humidifiers, it’s important to discuss what their purpose is. First and foremost, however, we need to understand what humidity is. Humidity is how we describe how much moisture, or water vapor, is in the air. It is not something seen by the human eye. It is usually talked about in terms of a percentage. For example, when the relative humidity is 100%, the air can’t possibly hold any more moisture, meaning that rain is more likely to happen. Humidity affects people quite drastically. Human skin relies on the air to remove water from the body. We see this in the form of sweat. Sweat evaporates into the air to cool us down. In an environment with 100% relative humidity, sweat can’t evaporate and so the body doesn’t feel cooler. At the other end of the scale when humidity is low, we might feel cooler because sweat evaporates readily and cools us down. The most comfortable humidity for humans is somewhere between thirty and fifty percent. Indoors, low humidity can cause problems. Low humidity indoors typically occurs in the cooler winter months when the air is dryer and temperatures are cooler. If the humidity in your home is too low, you may experience some problems. Low humidity causes the skin to dry out, including mucous membranes. This may cause you to experience dry skin, chapped lips or a dry throat in the mornings. Low humidity also makes the room feel cooler than it really is so you might end up cranking up the temperature and spending more money on heating. It actually costs a lot less to humidify a room that it does to warm it up. It’s important that a room isn’t too humid, however, as this can also cause problems such as increased dust mites, mold, and unhealthy bacteria. People understood the benefits of room moisture as early as the 1930s. The first patent was granted in 1934 for a Gas Humidifying Device. Nowadays, there are lots of different types of humidifier available and the products have really evolved over time. Although there are many different types of humidifier with different health benefits, they all work in a similar way. They all force invisible water vapor into the air in your room. Different humidifiers achieve this in different ways, which we’ll discuss below. So, if you, or any other member of your household, suffer through the winter months, a humidifier might just help to alleviate and improve symptoms. 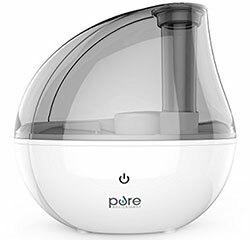 Humidifiers are known for helping the following problems: dry skin, sinus problems (including headaches caused by blocked sinuses), dry throats, irritated and bloody noses, dry coughs and cracked lips. 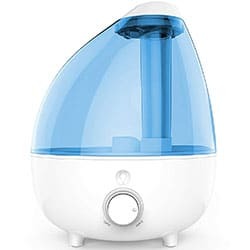 As I mentioned above, there are many different types of humidifier available to purchase nowadays and the type that you choose depends on the type of water vapor you want to put into your room. 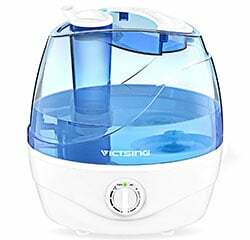 You will see humidifiers being referred to as warm mist humidifiers or cool mist humidifiers. Warm-mist humidifiers heat water until its scalding hot, then diffuse the steam it produces. Some even have filters that catch mineral deposits. These can mean an additional cost to the consumer as they will need replacing from time to time. Warm mist humidifiers are not great to have around young children as they can cause burns. Cool mist humidifiers use different methods to expel the mist into the room. There are three main types of cool mist humidifier: evaporators, impellers and ultrasonic. You will read more about these below. Central humidifiers: Central or whole house humidifiers are a permanent solution to controlling the moisture in your home and are built directly into your homes air conditioning or heating systems. This obviously comes with a higher cost, but you have the benefit of being able to control the humidity of your entire home. These also have the added benefit of not needing to be maintained in terms of filling with water; they are directly plumbed into your home water supply. Evaporative humidifiers: Evaporative humidifiers drive water vapor through a damp filter. They use fans to push the moisture into the air, increasing the humidity into your room. They are a cheaper solution than central humidifiers but only work in one room. They function with a wick system. The wick, which is made from paper, cloth or foam, draws water out of a reservoir in the humidifier. The fan blows over this wick and thus the air collects moisture. Steam vaporizers: These are electronic humidifiers that work by heating water before cooling it and releasing it into the atmosphere. Unlike impeller humidifiers, these aren’t particularly child-friendly as they can burn. They are the simplest and least-expensive humidifiers. They are, however, one of the most expensive humidifiers to run. A positive of the steam vaporizer is that you don’t need to worry about the purity of the water vapor in terms of bacteria or minerals. Ultrasonic humidifiers: These humidifiers use ultrasonic vibrations to create tiny water droplets that are emitted as a cool mist into your room. They have versions that use cool mist and warm mist. The cool mist versions are great for young families as they don’t burn. They are also silent, which is a big advantage. Ultrasonic humidifiers don’t cost a lot to run. As with impeller humidifiers, ultrasonic humidifiers could have problems with stagnant water if they are not properly maintained. Some high-end models, however, have antibacterial functions and use UV light to kill harmful bacteria. You also have to bear in mind the mineral content of your water as this will be expelled as a white dust into your room. Again, some models have filters that can remove the dust so that it is not expelled into the air. Impeller humidifiers: Impeller humidifiers have high-speed discs that rotate. When they rotate, the discs throw water through a diffuser, which breaks it into tiny droplets that are then expelled into the air. These humidifiers are relatively inexpensive and, because they use a cool mist, they are child-friendly. They are similar to evaporator humidifiers because they are single units suitable for a single room. They don’t cost a lot to run but you need to be careful not to allow the water inside to get stagnant as this will cause harmful bacteria to be distributed into your room. You also need to be aware that impeller humidifiers will expel any minerals in your water into the atmosphere, which may be harmful. Some models recommend using distilled water to avoid this issue. Ultrasonic humidifiers are some of the best humidifiers on the market. They can also be some of the least expensive too, which is great for those of you on a budget who wants a really good product. There are many advantages to ultrasonic humidifiers over other types of humidifier. Firstly, they are quieter than other humidifiers, particularly evaporative humidifiers, as they don’t have fans to expel the moist air into the room. If you have young children suffering from winter sniffles, they are ideal for increasing the moisture in their bedroom to give you a quieter night! Ultrasonic humidifiers also have a great advantage in that you can choose warm-mist or cool mist versions. With a warm-mist ultrasonic humidifier, the humidity will rise quicker in the room because the mist evaporates faster. This type also feels more comfortable in areas with cooler winters. 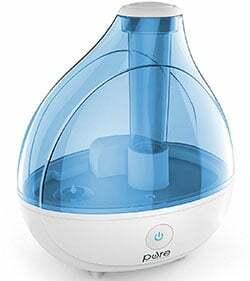 In terms of cleaning, ultrasonic humidifiers are really simple to maintain and are a lot easier to clean than other types of humidifier, particularly if you use them with distilled water. If you don’t like having to change filters, then you will find an ultrasonic humidifier better for your needs. Some people believe that ultrasonic humidifiers can kill bacteria and fungi in the water thanks to their ultrasonic frequency. It is important to note, however, that this has never been proven. Other types of humidifier, like evaporative humidifiers, don’t function as well when there is already a lot of moisture in the air. With ultrasonic humidifiers, this is not an issue because of the way they moisten the air with vibrating discs. So, if you want the humidity of your space to be on the higher side, then an ultrasonic humidifier might be the best humidifier for you. This might benefit people who have a lot of wooden musical instruments, wooden furniture or floors and expensive artwork that needs a moister air. However, there are some disadvantages to ultrasonic humidifiers. The major flaw with these is that they are renowned for producing a white dust as a by-product. This dust comes from the naturally occurring minerals present in hard water and as well as being annoying to clean up, it can be particularly harmful to anyone with a lung condition, such as asthma. Using distilled water should minimize this problem, but this adds an extra challenge. You can distill water yourself at home but obviously, this is time-consuming. Here at The Soothing Air, we have a thorough vetting process before we decide which products to include in our Buyer’s Guide and Review. The process is quite long and arduous but we deem it necessary in order to provide you, our readers, with the most up-to-date and accurate information on the products out there. For this ultrasonic cool mist humidifier review, our first task was to look at different products in the current market and read what people were saying about them. For this first stage, we read over 24,000 user reviews. Can you imagine how long it would take you as an individual to read that many reviews to find your best match? By reading these reviews, we were able to determine the important features that consumers need, want and get from each of the products. During the review process, we looked at more than ten different humidifier brands and amongst them, analyzed over 35 different ultrasonic humidifiers. We had to, of course, narrow these down to a shortlist – can you imagine the length of this guide if we went through everyone in detail? Our shortlist contained the best 21 products and we made this by doing side-by-side comparisons of all of the different products we had. With our shortlist of 21 Ultrasonic Humidifiers, we spent more time researching. We visited their official webpages and read through their manuals and specifications. We also made sure to compare the information we found against how they were marketed on different store pages to get a full picture and idea of what each product is like. Once again, we looked at individual critic reviews to verify that the descriptions we had were accurate compared to the information we already had from our initial research. Being accurate is really important to us! Our Top Ten products list was a result of this second stage of research. We came to our conclusions, and order of the Top Ten, after over 72 hours of research into these products! We will present our Top Ten to you now in this ultrasonic cool mist humidifier review. When reading the review of each of our Top Ten humidifiers, you will notice that we make reference to their features. We got our list of possible features from our initial shortlist of 21 products. These features provided an analytical result which helped us to shortlist the best 10 Ultrasonic Humidifiers among the 21. Most of the features were taken from the products’ manuals and specification sheets. Another important factor to consider was the pricing of each product. We have analyzed the cost of each ultrasonic humidifier in order to see its value per dollar in terms of its features. Finally, we have considered each product’s lifecycle by review frequencies to determine any misconceptions. The review frequency of a product gives us an idea of how often the product is bought. Therefore, we are confident enough to provide an accurate review for the users for the best products of 2018. To look at our review process in more depth and to understand how the products compare, please refer to our attached report. This ultrasonic humidifier is our favorite of all the products, because it is simply the best product on the market. It isn’t expensive, but instead gives you a roster of features that are great value for money. Each of the products you’ll see listed as Picks have been compared based on 20 positive features. This product contains the highest number of positive features of all of the ultrasonic humidifiers we looked at. It really is the Rolls Royce of ultrasonic humidifiers! With positive features like the adjustable speed settings and auto shut-off, this product has everything you could want and need. It even has built-in humidity sensors so you don’t have to install a thermostat in your house separately. In short, It certainly is the best of all the products we have researched. 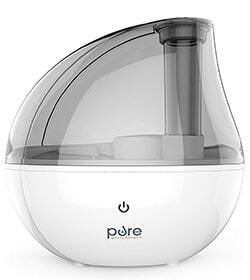 In terms of price, this Pure humidifier sells for around $40, which is a standard price. Most of the products in the market are also around this price so you’re getting so many amazing features in a regularly-priced product. If we look at the product reviews on Amazon, this ultrasonic humidifier had over 9500 reviews at the time we completed our research. This is the highest number of reviews for any ultrasonic humidifier on the market. The review frequency is impressive too. It received its most recent 10 reviews in the short time of three days. Prior to that, it received 10 reviews in 4 days and the previous 10 before that in just 5 days. This is exceptional. A higher number of days would signify a slower selling rate and, given that very few buyers actually take the time to write a review, we can estimate that this product is selling hundreds online within just a few days. It’s clear to say that this is a very popular product. Finally, our research and product testing showed us that this product is both powerful and aesthetically pleasing. It being a tabletop humidifier with a night light also makes it the perfect solution for improving the air quality in any room. All in all, it’s safe to say that this is by far the best ultrasonic humidifier we could find on the market. 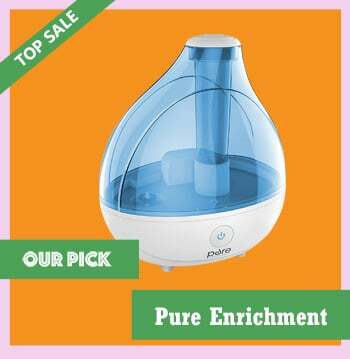 The Pure Enrichment MistAire is a cool mist ultrasonic humidifier that doesn’t require any filters. It measures 10.9 x 9.2 x 6.9 inches and weighs approximately 1.75lbs, making it the lightest ultrasonic humidifier in our review. This humidifier moisturizes the air in your room for up to 16 hours at a time, which means you can easily use it overnight or in your home office for a long period of time. This is actually the shortest operation time of all our picks but we think it’s still really good. It can hold 1.5 liters of water in its easy-to-fill water tank and is best for a medium-sized room like a bedroom or office. It also has a built-in humidity sensor. In terms of settings, you can set it to operate at high or low speed and you can also adjust the mist direction for your comfort. This humidifier has an automatic shut-off function that turns the device off when the water level is low or if you remove the water tank. This is an ideal product for use in a bedroom at night because it is whisper quiet and has an optional night light. The humidifier comes with a disc cleaning brush to help make cleaning easy. You can also adjust the direction of the mist towards areas that need more moisture. The nozzle allows for a full 360° rotation. The Pure Enrichment MistAire comes with a 2-year warranty and has 7-day customer support. It is a really affordable product at $39.99 and has over 9400 reviews. Its average rating is slightly on the lower side compared to the rest of our list, with 3.9 out of 5, but for a product with so many reviews, it becomes much more difficult to retain a higher average rating. The review frequency is fantastic, meaning that this product is being bought by hundreds of people week by week. This is by far the best ultrasonic humidifier out there. You simply can’t beat its exceptional value for money or the number of positive features it has! Because it’s small, it would make a great portable humidifier. This ultrasonic humidifier is a perfect budget pick for people looking to spend less. Other customers really like it, and not only is it easy to refill use, but it also doesn’t take up much space at all. Most of the products in our Top Ten come in at around $40 so we’ve chosen our Budget Pick based on the fact it is on sale for at least $10 less. This is definitely one of the most affordable products on our list. However, this low price does not reflect a low quality. It still has 13 positive features, even exclusive ones like Vicks Pads to emanate medicinal properties while it humidifies. If we look at the price per feature in conjunction with the quality of those features, this product becomes our unrivaled budget pick. The average user rating of the VicTsing ultrasonic humidifier is also good. It had an average user rating of over 4 stars when we completed our research. This came from around 250 reviews and astounding review frequencies of 2 days, 3 days and 4 days. This means it has the best review frequency in our Top Ten. It’s definitely among the most popular ultrasonic humidifiers on the market. On a final note, this ultrasonic humidifier has one control knob, which is used to adjust the mist output in any direction with ease. The nozzle is tilted at a 45° angle, which is specially designed to give off continuous mist. It also means that it covers a greater area whilst humidifying so you get all the benefits that a cool mist a humidifier has to provide. Lastly, this product has the best cost to performance ration in our Top Ten. The VicTsing measures 10.8 x 7.5 x 10.2 inches and weighs 2.3lbs, which is less than average for our Top Ten products. It has a cool mist and an easy filter. This humidifier has a 2-liter water tank and can last for 24 hours. It is suitable for a medium-sized room. With this model, you can’t adjust the speed settings, but as it’s our Budget Pick, this isn’t expected. It still has mist rotation, an automatic shut-off and is whisper-quiet 32db, which is quieter than a computer. It doesn’t have mist control but you can adjust the mist direction. With a 2-year warranty, you can really be happy that your $30 is well looked after. It has an excellent rating of 4.3 out of 5, coming from 250 reviews. Its review frequency is excellent. In fact, it has the best review frequency of all of the reviewed products. A great buy as our Budget Pick. At only $30, you won’t be left disappointed by its value for money. You just have to look at how often it is reviewed and its average rating to be confident that you’ll be happy buying this product. This is an awesome ultrasonic humidifier, so why isn’t it our top pick? It is an advanced choice for those who have no budget. It has some excellent extras and is even remote controlled! This product has the highest number of positive features, along with our Top Pick. It is, however, much more expensive and has a heavy price tag of $90. Therefore, we couldn’t place it as our number one. With the highest number of features and some of the most advanced and exclusive being among them, we feel the price is justified and have, therefore, listed this product in third place as our Advanced Pick. Firstly, it is the only product in our list that comes with a remote control as well as an auto-humidity monitor. This ultrasonic humidifier uses its sensors to monitor the humidity in the room and adjusts its humidification settings. It also has adjustable speed settings that you can control both manually and remotely. Its average user rating is 4.5 out of 5 on Amazon. This is amazing since it has over 1000 reviews. In terms of review frequency, its most recent 10 reviews were written over 20 days, the previous 10 in 21 days and the 10 before that in 7 days. This is still a good review frequency even though it is not as good as some of our other picks. If you decide to buy our Advanced Pick, it would definitely trump our Top Pick, but you should be prepared to spend over two and a half times more if you do. Its dimensions are11.3 x 7 x 10.5 inches and has a weight of just under 5lbs, meaning our Advanced Pick is the heaviest and biggest ultrasonic humidifier but it certainly packs a punch. It doesn’t require any filters. It operates with both warm and cool mist, allowing it to increase your room’s humidity 25% faster than cool mist appliances. 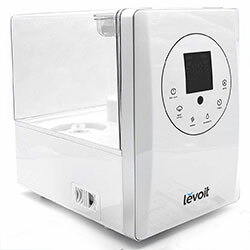 The Levoit has the longest operating time of all the humidifiers in our Top Ten at 36 hours and it holds an impressive 6 liters of water. It has adjustable heat settings and is suitable for larger rooms. 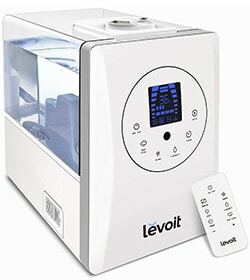 It is the only humidifier in our Top Ten with a remote control. It also has a humidity sensor. It produces less than 36db of noise, which means it’s whisper quiet. You can easily refill the water tank and adjust the mist direction. It displays the actual humidity so you know where you stand and whether to adjust the controls. It also has a smart auto function, which can automatically release mist to adjust the humidity. Finally, it has a special design that is leak proof and made of ABS plastic, which means it’s less likely to break. In terms of warranty, this humidifier comes with 2 years’ manufacturer’s warranty. It has a really good rating of 4 out of 5, coming from over 1000 reviews. Its review frequency is good, although not as good as other products, but this is probably due to being more expensive. This is our Advanced Pick, so it is not surprising it costs around $90. If money isn’t so much of an issue for you, then this humidifier is the best you can get. At $90 it is on the expensive side but it certainly packs a punch. This is by far the best cool mist humidifier for large rooms. 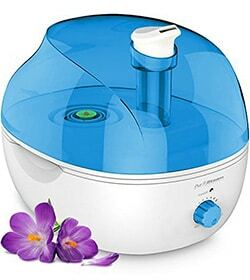 This ultrasonic humidifier is another really top choice for its price. For your money you get a product that is easy to use, and is excellent for use at night, as it boasts a special nightlight feature. The PurSteam Ultrasonic Cool Mist Humidifier is the second lightest unit after our Top Pick, weighing a light 2.2 pounds. It measures 10.8 x 10.1 x 8.3 inches and is a cool mist humidifier that doesn’t require a filter. This moisturizing humidifier has an operation time of 17 hours, which is the second shortest operating time after our Top Pick. It has adjustable speed settings and holds 2.2 liters of water, which means it’s ideal for a medium to large sized room. What’s more, it’s easy to adjust the mist direction and speed. The unit itself has an indicator light to show when the water level is low. 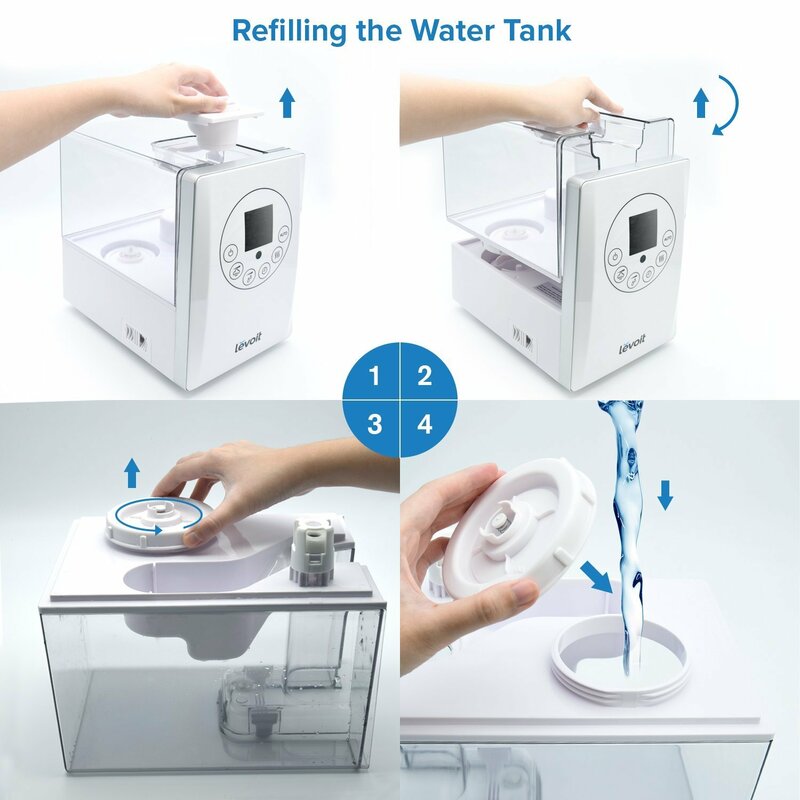 It also shuts off automatically if the water is too low or if the tank is removed. This ultrasonic humidifier is so easy to use. The mist direction can be directed to suit your needs and requirements. There is a variable button to control the unit and humidity levels for effective mold growth prevention. There is also a separate button for the night light. The PurSteam has 15 positive features and has a great average rating of 4.3 out of 5 coming from 652 reviews. It has a fantastic review frequency. At the time of research, the most recent 10 reviews were submitted in the space of 4 days, the previous 10 in 8 days and the ten before that were submitted in 5 days. This humidifier is also great for night time use as it is really quiet and also has a night light function. It is a cheap humidifier that costs a really reasonable $29.99 and has a 2-year warranty. The PurSteam is a great humidifier that has excellent reviews and costs a really reasonable $29.99. It’s great for nighttime use too, with the nightlight feature. This ultrasonic humidifier is a great silent option, running really quietly so you won’t be disturbed. It can sit on top of any desktop and look good. The only downside is that it isn’t too popular, but don’t let that put you off! The Upperx Cool Mist Humidifier has a unique design that adds a definite sophisticated air to any home environment. It weighs 4.2 pounds and measures 12 x 9.1 x 8.9 inches. It has an easy filter too. It has a great 24-hour operation time and adjustable speed settings. The water tank holds 4 liters and is suitable for a medium-sized room. It uses very little energy. The automatic shut off kicks in when the water level becomes too low. This prevents overheating. You can adjust the mist to three different settings: low radiation, nano mist, and purification. You can also rotate the mist direction through 360 degrees. Finally, the Upperx Cool Mist Humidifier is very quiet. In fact, it only produces 30db of noise, which means you can sleep or work soundly without an irritating whirr. The humidifier comes with a cleaning brush for the inside of the unit. It is recommended to clean the humidifier once a fortnight. This humidifier has 13 positive features, one of which is a special tray where you can add essential oils, as long as they are water-soluble. Also, this humidifier has a purification system. This means that it produces around 300 million negative ions that cleanse the air and sterilize the water. 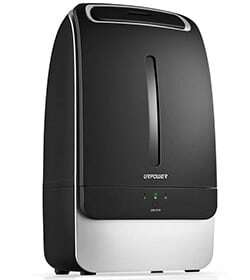 As well as a 2-year warranty, the Upperx Cool Mist Humidifier has a 30-day money-back guarantee. As far as reviews are concerned, this humidifier has an average rating of 4.4 out of 5 which is excellent. However, at the time of research, it has significantly fewer reviews with only 53. This means we couldn’t put in any higher than our number 5. It costs around $38.99. If the lack of reviews doesn’t put you off, then this is a great product. If the number of reviews concerns you in relation to other products in our Top Ten, then don’t forget you can get your money back within 30 days if you are not satisfied. This ultrasonic humidifier has a sleek black design that looks good. So if you want something with style, then this is the pick for you. It is also easy to use, cheap and features a handy sleep mode also. This URPOWER MH501 is a cool mist humidifier with an easy filter. It is somewhat larger than other products in our Top Ten. It measures 16.2 x 10.1 x 7.8 inches and weighs 4.4lbs. Even though it is larger, it is not the heaviest of products on our list. Its black design makes it stand out from other products. This humidifier has the largest water tank capacity of all the products in our Top Ten and is capable of holding 5 liters of water. However, it doesn’t operate any longer than other models and has an operating time of 24 hours. It is suitable for medium-sized rooms and has both an auto shut-off function and mist rotation. This cool mist humidifier is really easy to use. In fact, it only has one power button and no other controls. To put this humidifier into sleep mode, you need to long press the power button. To choose the mist output (low, medium or high), you simply need to short press the power button to switch. But you can’t add essential oils to the water. It has 13 positive features, which is 4 fewer than our Top Pick. It does have a nice night light feature, though. Price-wise, it is similar to our Budget Pick and costs just under $30, which is really affordable. It has a good number of reviews too. In fact, it had just under 2800 at the time of research. However, what lets this humidifier down slightly is its average rating. It has the joint-lowest average rating of all of the products in our Top Ten, only achieving 3.6 out of 5. It does, however, have good review frequencies so if the average rating puts you off you can see up-to-date comments on what consumers think about it. Finally, this humidifier has a one-year warranty. This is the shortest warranty in our Top Ten. 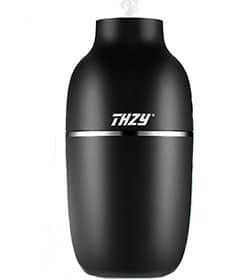 If you’re looking for something more stylish, this humidifier has a great black design. It is worth reading some customer reviews, however, as it does have the lowest rating of products in our Top Ten, which might put some consumers off buying this product. This ultrasonic humidifier is great for people who are looking for a product to help relieve the symptoms of cold and flu. It uses Vicks pads to do this, and has some great features to ease your pain. The Vicks Filter-Free Ultrasonic Humidifier is a cool mist humidifier that weighs 4lbs and measures 10.9 x 9.4 x 13.5 inches. As its name suggests, it doesn’t require any filters to operate. This humidifier has the longest operating time of all of the products in our Top Ten and can function for an impressive 30 hours despite only having a water tank capacity of 1.2 liters! It is ideal for covering a medium-sized room like a bedroom or office that measures between 100 to 400 square feet. It has an auto shut-off safety feature so you don’t have to keep track of when you started it operating. It has adjustable speed settings and you can also control the mist direction. Finally, this is a great cool mist humidifier for a baby as it is quiet enough to use in a nursery without disturbing their sleep. It is really easy to use and very low maintenance. The water tank has a wide opening, which makes it really easy to clean. 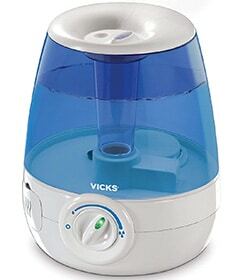 Being a Vicks product, you can also use Vicks VapoPads in this humidifier to help ease congestion or cold and flu symptoms. It has a special slot where they can be placed. This product has a good 14 positive features and costs around $36. It does have some of the lowest review frequencies in our Top Ten, but these are still not problematic. It has an average rating of 3.9 out of 5 coming from 821 reviews. It has a 2-year guarantee too. If you’re looking for a humidifier to help relieve cold and flu symptoms, this one is ideal since you can use VapoPads to add a eucalyptus scent into your room. This ultrasonic humidifier is more highly priced than other picks on our list, but it does have some great features. It is the best one we have for babies, and it is also simple and clean to use. 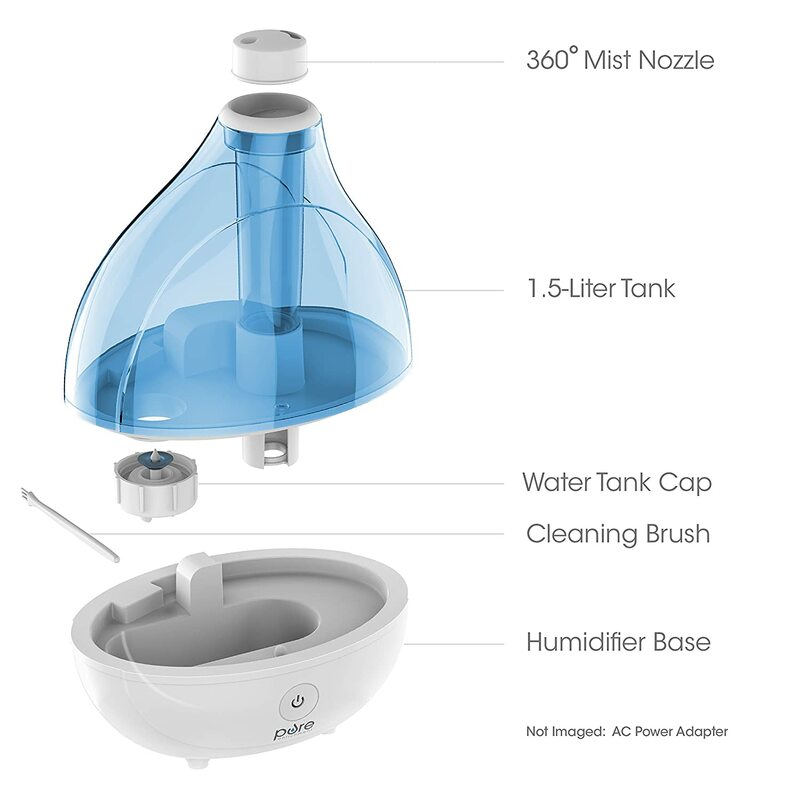 The MistAire XL is a cool mist humidifier that weighs 3.6lbs and measures 10.9 x 9.2 x 6.9 inches. It doesn’t require any filters to operate. 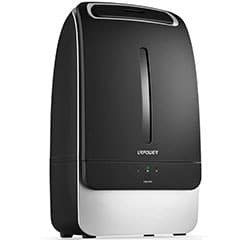 With a 4-liter water tank and a 24-hour operating time, this humidifier is suitable for large rooms. It has adjustable speed settings and mist direction. As with most products in our Top Ten, this product has auto shut-off so you don’t have to worry about short circuits or overheating. This is a great humidifier because it has a built-in humidity sensor unlike the majority of products in our Top Ten. It operates silently too so is great for a baby’s bedroom or an office. Overall, a great choice to keep your home air safe and comfortable. It comes with a brush for easy cleaning and is really simple to use. It has 2 mist nozzles so you can customize the flow of mist in your room. You can also easily the mist output. This product does have a nightlight and you can actually change the color of the nightlight to suit you. You can choose between blue, green and red. With 15 positive features, this is a great humidifier, having over 1000 reviews with a very good average rating of 4.2 out of 5. It also has good review frequencies. This humidifier is, however, the second most expensive in our Top Ten list and costs just under $60. It does, nevertheless, have the longest warranty period with 5 years so. Despite its cost, you can rest assured that the manufacturers are confident in their product by offering this warranty. If you’ve got money to spend but don’t fancy our Advanced Pick, then this one is a good product to buy. You can rest assured that you will have many years of use from this humidifier thanks to its 5-year warranty. This ultrasonic humidifier has some nice extra features like its antimicrobial materials, which stop bacteria growth. It is also great for larger rooms and a well-reviewed pick by customers. 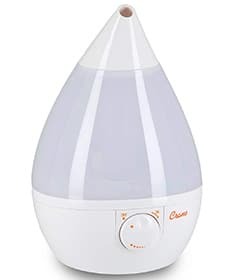 The Crane USA humidifier is a cool mist ultrasonic humidifier that is one of the sturdiest products in our Top Ten, weighing 4.5lbs. It measures 8.6 x 13.4 x 8.6 inches. It doesn’t require the use of a filter but if you live in a hard-water area, there are special filters you can buy to help demineralize your water. The Crane can operate for up to 24 hours. It can humidify spaces up to 500 square feet. Although it doesn’t have adjustable speed settings, you can adjust the mist direction. It has automatic shut-off so you don’t have to worry about the water running out. 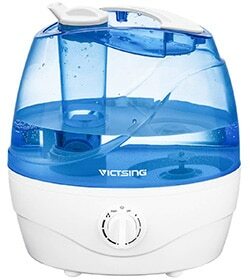 This humidifier is really easy to fill and holds 4 liters of water. Furthermore, this product is whisper quiet so you don’t need to worry about being disturbed by it in your home or office. This unit is built from materials with antimicrobial properties thus reducing the possibility of bacteria and mold by around 99%. This humidifier has the joint-fewest number of positive features in our ultrasonic cool mist humidifier review, with only 12. It is, however, quite an expensive product if we look at the price-to-feature ratio as it costs around $50. The average rating is also on the lower side at 3.6 out of 5, making it the joint lowest on our list. It does, however, have a large number of reviews. It has the second highest number after our Top Pick, with over 4800. The review frequencies are pretty good too. In terms of warranty, it comes with 2 years as standard. There are products out there with better price-to-feature ratios but the antimicrobial materials are definitely a huge selling point with this machine. It also has a lot of reviews that you can pore over so you can be sure to know what other buyers have experienced before making your purchase. The last pick on our list is still a great choice, as it is quiet and can work light-free. It is the smallest pick on our list so only works well in smaller rooms, but it is still a solid option. The MistAire Silver is a cool mist ultrasonic humidifier that measures 7.9 x 5.7 x 8.1 inches, making it the smallest humidifier in our Top Ten list. Furthermore, it is also the lightest product, weighing in at 2.2lbs. It uses easy filters. This moisturizing humidifier is a small humidifier that can run for 25 hours and has the joint-smallest water tank capacity along with our Top Pick, at 1.5 liters. It has adjustable speed settings but is only suitable for a small room due to its size and output. You can also adjust the mist rotation. It is whisper quiet and has reduced beep noise when it is being turned on and off. It runs at less than 32db. Also, the power indicator light switches itself off after 10 seconds, which means it is a completely light-free unit. This humidifier unit comes with cleaning control, which makes it safer. It is a really easy unit to operate and there will be less humidifier issues to handle. The MistAire Silver has a built-in nightlight which offers a really soothing light. The warranty on this product is 2 years and it has a good rating of 4 out of 5 coming from 614 reviews at the time of research. Its most recent 10 reviews were received within 12 days, which is positive. However, the review rate was slower prior to that. This unit costs $39.99, which is the same as our Top Pick, however, it is clear to see that this doesn’t have as many features (12 compared to 17) nor as many reviews. This humidifier is ideal for a small nursery because it is really quiet, has reduced beep noise and can be light free if required. Furthermore, it can have a really soothing night light for use with young children that don’t like sleeping in the dark. An ultrasonic humidifier is a great addition to any home suffering from the ill effects of low humidity and any one of the above products will certainly improve the moisture in the air in your home if the natural ways don’t work out for you. Choosing the best humidifier is down to personal needs and preference. You need to think about the size of your room and what functions you want your humidifier to have. Whatever your options, you can trust that these ten products are the top rated humidifiers available in 2018. It is worth reading up about ultrasonic humidifiers to ensure you are happy with the safety of these devices so that you can choose one that is going to give you clean and pure air. Unlike other types of humidifier, ultrasonic humidifiers release a white dust into the air in your home. This dust is nothing more than the impurities and minerals found in the water. This dust can cause problems for those with weakened immune systems or existing respiratory problems. 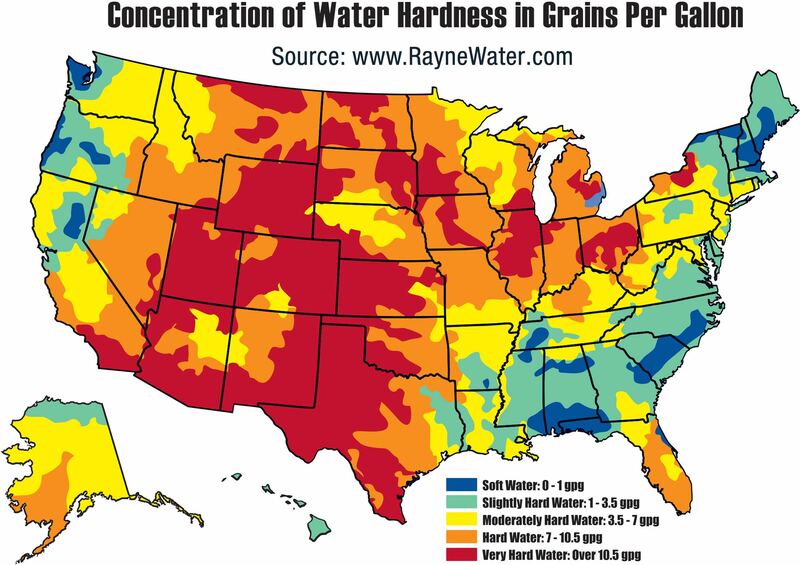 Using filters and distilled water can greatly decrease this issue. Another safety issue to consider is the risk of electric shock. We all know that water and electricity do not mix, yet this appliance uses both. It is wise to always act with caution when filling the water tank and making sure you don’t touch it with wet hands. It is also important to keep children and animals away from the humidifier. With these common-sense precautionary measures, there is no issue with using an ultrasonic humidifier. We hope that our ultrasonic cool mist humidifier review and buyer’s guide has helped you in your decision. If you are still undecided, our Top Pick is a great place to start or you can read our research report to see side-by-side comparisons of all of the products we tested.